Porsche Cayman S delivers the bite. 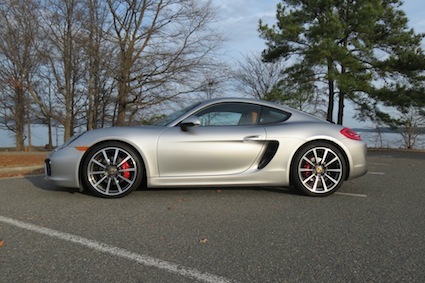 Some like it hot: 2014 Porsche Cayman S.
Porsche is a name that is widely known, but it may not be fully understood by the motoring public outside of sports car enthusiasts. Personally, I straddle the line between the two camps, preferring sport sedans (Dodge Charger, BMW 3 Series, et al) for practical reasons: I need a back seat for my two teen boys, but my playful side immediately warms up to most any coupe outfitted with a robust engine paired with a stick shift, including one recent Christmas season visitor: the 2014 Porsche Cayman S.
The Cayman line has been updated for 2014, retaining the styling cues that have defined this mid-engine sports car since its 2005 debut. The Cayman is the coupe version of the Boxster cabriolet, itself introduced in the late 1990s. Thus, these two models are mechanically the same and are treated as a singular model line by Porsche itself. Among German sports car faithful you may hear dark whispers that the Cayman does a better job of upholding the brand’s iconic good looks than the 911, the quintessential Porsche line that celebrated its 50th anniversary in 2013. Those whispers may be received as blasphemy for Porsche purists who define authentic Porsches as those with a rear-engine, rear-wheel drive layout. Yet, there is an element of truth here too: the current 911 is slightly larger than the previous generation model although its mechanical underpinnings remain true to the original Porsche. As for this intrepid writer, he knows better than to insert himself in any controversy that cannot possibly deliver an irrefutable response, one he prefers to leave for the purists and enthusiasts to debate. Instead, just hand him the keys and he’ll slide behind the wheel, acquaint himself with the ignition layout, start the engine and promptly take to the road and put it through the paces. Those paces are enjoyed with the larger of two boxer (horizontally-opposed) engines sitting in the middle of this sports car: a 3.4-liter flathead six cylinder making 325 horsepower at 7,400 rpm and 272 foot-pounds of torque at 4,500 rpm. The standard Cayman is outfitted with a 2.7-liter boxer engine making 275 horsepower at 7,400 rpm and 213 foot-pounds of torque at 4,500 rpm. Both engines are paired with a 6-speed manual or can be equipped with an optional 7-speed dual-clutch automatic with steering wheel-mounted paddle shifters. The tested Porsche Cayman S (priced from $63,800) carried an $88,835 sticker price including a $6,730 infotainment package highlighted by a deliciously magnificent Burmester audio system — more about that later. 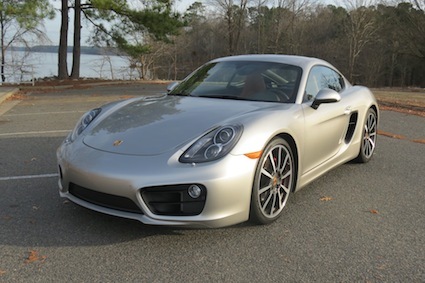 For budget conscious shoppers, the tamer standard 2014 Porsche Cayman retails from a more attainable $52,600. Allow me to cut to the chase here: if you can afford a Porsche, opt for the Cayman S and dress it as you please. Avoid the totally pointless and needless angst that you might otherwise feel. There is another argument about sports cars that I would like to see laid to rest: “there is no replacement for displacement.” True, higher displacement engines typically bang out more horsepower and torque, and drive faster. Then again, with direct fuel injection, turbochargers, and valve lift technology, smaller engines can provide much power too and in some cases outperform larger engines. Ford has demonstrated this point with its line of EcoBoost engines. For Porsche, you don’t see turbochargers for the Boxster/Cayman. What you do get is direct fuel injection and VarioCam Plus, the latter combining intake-side camshaft control (VarioCam) and intake side valve lift switchover (Plus) to maximize power and improve the engine’s torque characteristics. No longer available is the Cayman R with its free-flowing exhaust system and 10-hp boost. Rumored to make an appearance at the 2013 Frankfurt Motor Show was a turbocharged Porsche Cayman S. With four cylinders. That vehicle did not appear nor were the rumors of an upcoming turbocharged version quelled. So, let me say this: as delightful that its engine is, the Cayman’s performance is trumped by its exemplary steering and emotional handling. Of course the two go hand-in-hand especially when you’re pushing up the rpms. And the easy shifting transmission shifter is as balanced as this sports car is capable, what allows the driver to handle every twist and turn of the road with equanimity and the parking lot doughnuts you may try with its stability control shut off. And should you stall out the engine in one of your romps, it’ll automatically restart when the clutch is engaged. The Cayman looks as if it is always on the go. Equipped with a Sport Chrono package, the Porsche Cayman S is best experienced by activating the Sport Plus setting, what automagically enhances chassis, engine and transmission settings, and calibrates the suspension for harder damping and controlled steering for the ultimate in road-hugging excitement. The Cayman S connects the driver to the road by providing confident steering, excellent grip and it can also take 90 degree truns brake free. And those times that you have to stop fast you’ll appreciate how quickly its braking energy is mobilized and how obedient this two-seater is on demand. Porsche makes the most of a diminutive cabin by equipping the Cayman S with seats that are comfortable, highly supportive, and adjust in 14 ways. Insane changes in December ambient temperatures meant giving both the seat heating and cooling features a work out, mostly to extend the comfort level for those longer drives. There was no back massager present, but enough heat was dispensed to limit the attendant sports car stiffness. The front and rear storage areas are small, but add up to 15 cubic feet of storage room or what the average midsize sedan delivers. You can place a pair of average size duffle bags in the rear compartment and boxes or other square containers in the deep hole found in the front compartment. Two deep covered storage trays also sit in the rear compartment, large enough to hold your stash of…. Okay, let’s not go there. 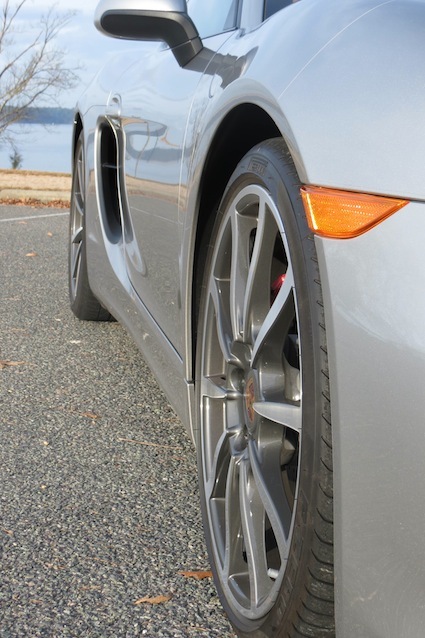 Porsche swiped the wheels from the 911, outfitting this model with 20-inch Carrera wheels. Low-profile Pirelli P-Sport tires were the right fat boys for this ride, offering a practical complement to the wheels or as one friend exclaimed, “those tires are sick! ” And the distinctive air scoops fore of the rear tires are both a strong design statement and act as air inductors for the engine. This athlete is ripped and has the six-pack abs to cover its polished frame. Fat boys tires are set within beautiful 20-inch wheels. While there yet remains clear distinctions between 911 and Cayman, it should be noted that the upstart model has its place in the Porsche line. Its design is phenomenal, delivering the requisite eye candy and enough intimidation to get everyone to notice. Its net storage areas trump the 911 and while its muscle-pumping performance is overshadowed by its iconic sibling, its driving characteristics may have you seriously considering the second generation of the newer arrival. Come summer 2014, a fifth Porsche model will hit the market: the Macan — a small sport utility vehicle. With a starting price around $40,000, the newest model will mostly likely outsell Porsche’s current best selling Cayenne SUV. 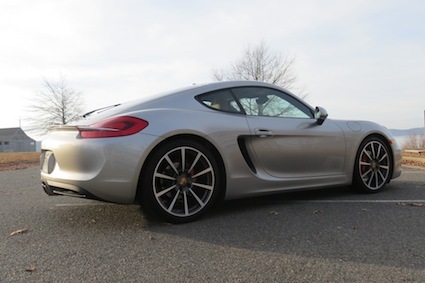 The Porsche brand is changing, but when it comes to sports cars the Porsche Cayman S has the bite and moves worthy of its name. EPA: 20 mpg city, 28 mpg hwy. 2013 BMW M6 Coupe: Sweet! Porsche Cayman S photos copyright Auto Trends Magazine.